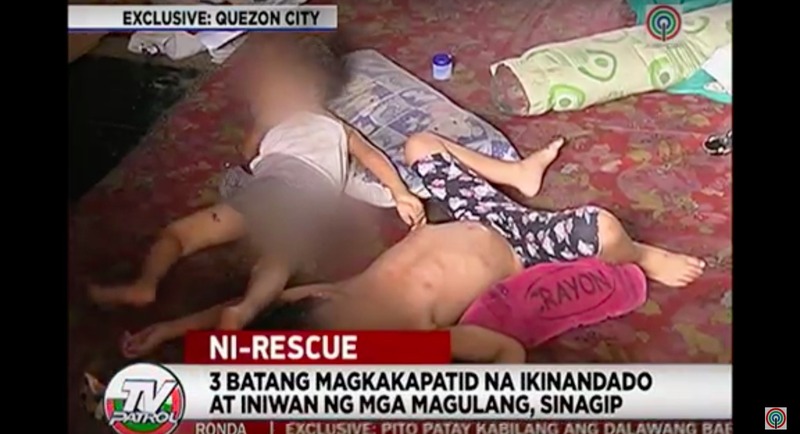 MANILA, Philippines - Three siblings aged 3 years old ,1 year old and 8 months, abandoned by their parents inside their locked home in Quezon City, were rescued by social workers from the City’s Social Services Department. Apparently, the small children had been left alone in the house without food and water for three days. Fortunately, a neighbor identified as John Michael Ancheta informed ABS-CBN News about the children’s pitiful condition. Ancheta revealed that the parents even prevented them from giving food as they didn’t want the children to get used to it. “Minsan po pag ka pinapakain namen na andito sila binabawal nila dahil masasanay daw po ng mabubusog,” Ancheta said. The neighbor also disclosed that it wasn’t the first time that the children were abandoned. According to him, they just give food to the children but don’t touch them for fear that they will be blamed if something bad happens to them. After seeing the children’s conditions, ABS-CBN News immediately contacted people from Quezon City’s Social Services Department who bathed and fed the hungry children. Upon examination, doctors found that the children were severely dehydrated, malnourished and suffering from bacterial infection in the skin. One of the doctors told ABS-CBN News that the children could die from septic shock if they aren’t teated immediately. “With this children walang kakayanang alagaan ang sarili nila, walang kakayanang pakainin ang mga sarili nila, iiwan mo sa isang bahay, ipa-padlock mo. (They don’t have the capability to take care or feed themselves, then you’ll leave them inside a locked house.) That is a grave offense,” a woman from the Social Service Department said. Meanwhile, the children’s grandmother, Dolores Centeno, said she is determined to file a case against the parents of the kids since it was already the second time that they neglected the children.